OK, so we’re looking for an inspirational character to help promote Women’s History Month here at Manchester University Press. The person I have in mind is a committed feminist and socialist, who allows her views to be seen but not to dictate her choice of role. 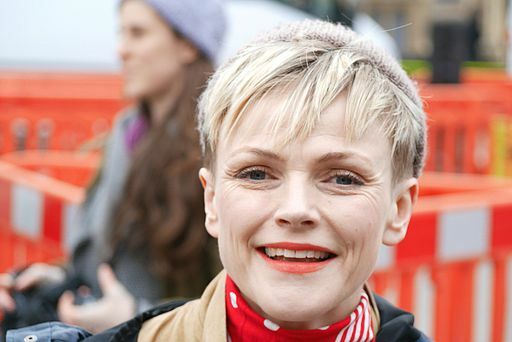 It is local actress Maxine Peake. Her acting CV is a glorious list of superb performances. From being one of the first (and only) women to play Hamlet on stage (at the Royal Exchange in Manchester in 2014), and her role in general as Associate Artist at that wonderful Manchester institution (and we must also mention her performance as Blanche Dubois in A streetcar named desire in 2016) to a leading role in seminal northern comedy drama Shameless. Not forgetting her wonderful performance as Twinkle in Victoria Wood’s only TV comedy sitcom Dinnerladies, to the difficult portrayal of Myra Hindley on TV in 2006’s See no Evil, Hear No Evil, and to the work that she herself has written or heavily influenced, such as Queens of the coal age and Beryl: A love story on two wheels we see a wide variety of stunning, thoughtful, powerful performances that demonstrate what acting can be like when it comes from the heart. Peake has always been upfront about her political views and her long involvement with the Working Class Movement Library in Salford and her recent leading role in events such as Radical Readings and the Comma Press organised Protest: Stories of resistance (Maxine is a patron of Comma Press) as well as her recent collaboration with Johnny Marr via the music video The Priest, about the enduring and ongoing problem of homelessness (also covered in Men who sleep in cars which she narrated) has only reinforced this. Her inspired and powerful reading of Shelley’s The masque of anarchy at the Albert Hall in 2013 had me (and judging by appearances most other members of the audience) ready to march directly down to London and demand David Cameron’s instant removal from office. She also played a key role in Three girls about the Rochdale grooming scandal. She is generous with her time – she has recently been appointed as an Honorary Professor of Literature and Performance at the University of Manchester and is genuinely excited about the prospect of inspiring and being inspired by the students that she will come into contact with. Also as mentioned, she is a patron of both the Working Class Movement Library which houses a vast collection of materials about working class life and the difficulties the working class have faced, and conquered over the years, and Comma Press, the radical short story publisher based in Manchester whose output in recent years has been award-winning and game-changing. Maxine is an example of someone from a working class, northern background who has, under difficult circumstances and in a very tough environment, carved out her own place without compromising her ideas and beliefs one bit. Talented, scene-stealing, versatile, generous and powerful. She is an inspiration. Category: Blog, History, Reference, Social History	0 Comments.